I’ve been spearfishing for about six years, mostly in Hawaii. I usually dive from shore, going after reef species like jacks, parrots and snappers. Recently I had a chance to go after some bigger game on the Pacific coast of Panama. A good buddy of mine from college, Jose Goldner, is from Panama and an avid diver and fisherman. He’s teased me with pictures of monster fish for years, and I passed the time on my flight from Honolulu to Panama daydreaming about huge snappers, groupers and pelagics. I invited my cousin Bob from San Francisco to join me on this adventure and we met up with Jose and his business partner Brian in the town of Pedasi, which is about a 4 hour car ride down the coast from Panama City. We were going to stay at Jose’s "farm". It’s a piece of beachfront property several hours panga ride from the last good harbor. We spent a day shopping for provisions. Jose’s property is hours from civilization. It’s got no electricity, no roads, and no potable water. We brought everything for our three day trip, including water, ice, wasabi and lots of beer, with us on the pangas. We had two boats, captained by local fishermen Avidel and Olmedo, both of whom were old friends of Jose’s. It took all morning on the first day to get to the farm. If you’ve never ridden several hours over bumpy seas in a panga, consider yourself lucky. The pangeros kept the throttles wide open and we got battered and soaked. Despite the warm temperature I ended up putting on my wetsuit to keep from shivering. It was a miserable ride, but I kept repeating to myself that the farther you get from civilization, the more fish there’ll be. I was encouraged by the fact that we went by bird piles and boiling, fishy water constantly on the way out. The kind of bait balls that we drool over in Hawaii were commonplace. We slowed down for a bit of trolling mid-morning and in less than ten minutes had a couple of 10 pound shibis in the boat. All we’d brought with us in the way of food was some rice and beans, but it was obvious that feeding ourselves wasn’t going to be a problem. As it turned out, before we headed back we’d feasted on lobster, tuna, grouper, snapper, amberjack and rooster fish. Not to mention iguana (tastes like fruit) and a local wild pig that Avidel picked off with a .22 at the farm. We got to the farm and were greeted by the caretakers, a couple of local guys who Jose has watching the place. A lot of what we brought out was actually for them, because they don’t get to a store more than once every couple of months. They had a cart hitched up to a horse and met us on the beach to take our gear up to the house. Valet service! The house itself was brand new and surprisingly nice. It was simple, but considering that every single brick and beam had to be brought out by panga, I was amazed. We each had our own bedroom and there was a nice shower facility in the back and even a smokehouse to do the cooking. A river runs down out of the nearby mountains and borders the property. In the rainy season it gets pretty big. This time of year it was little more than a clear pond that we could refresh ourselves in after diving. WE spent about a half hour touring the place and then we were back on one of the pangas, headed out to an island about 30 minutes from shore. It was time to dive. My cousin Bob is an avid surfer but had only gone spearfishing once with me on Moloka’i about two years ago. I spent the time on the way to the island going over the basics and getting him reacquainted with the gear. He was going to use my Beauchat 110cm while I was going to try out my new baby, a Riffe... with a reel and slip-tip. I’d purchased it just for the trip and was anxious to try it out. I didn’t have to wait long. We arrived at a small islet, maybe a hundred yards across. Jose knew the area from prior trips and our plan was to dive on an underwater rock that rose up to within twenty feet of the surface about a half mile west of the island. Avidel took us right to the spot as if he had gps and we dropped a buoy on an anchor line to mark the spot. The visibility didn’t look too good from the surface and it was obvious that there was a strong current. We decided to partner up and jump in up-current from the buoy and drift past it, diving on the ledge as we went by. On this first dive my main priority was to stay with my cousin Bob and make sure that he wasn’t having gear problems. Entering the water, I was immediately surprised at the visibility, which was only about 15-20ft. The water was filled with plankton and other organic matter and that added to the murkiness. Below us there was no bottom in sight, but pretty soon I began to make out large schools of 2-3lb jacks and larger yellow salemas rushing about in all directions. It was quite a scene. After getting a thumbs-up from Bob I dropped down about 20 ft. I still couldn’t make out the bottom, but now I was immersed in a school of baitfish. I stayed down for a while and just enjoyed the experience. In Hawaii I’m used to stalking my prey. I spot a fish or group of fish from a distance, then I drop down into the bottom structure and use it as a blind from which to ambush fish that come in for a look. Hanging in the void surrounded by hundreds of fish, all of which were every bit as large as many of the fish I hunt back home, was awesome. I came up for air as Bob dropped down for a look. Taking my bearings on the surface I was surprised to see that we had already drifted past the marker buoy. I was equally surprised to see Jose sitting on the panga, helping Avidel pull a fish over the side. It was a large pompano. Five minutes and Jose already had a fish. I called to him and he waived, a big smile on his face. "Dude, there’s big fish everywhere!" he yelled excitedly. That was all I needed to hear. I took a deep breath and headed back down. Leveling off again at around 25ft I held my gun at the ready, waiting to shoot anything big that came my way. Nothing did. Bob and I took turns but after only a couple of dives each it was obvious that we’d drifted too far off of the rock. We were out over deep water and the bait fish had disappeared. We called the panga over and Avidel dutifully drove us back to the up-current side of the rock for another try. Meanwhile, Jose was already hooked into another fish. This time it was a 20lb bluefin trevally. Brian, Bob and I had yet to see anything that large. Jose assured us that the fish weren’t deep, and that we just had to keep our eyes open. The current was taking us off the rock again and we kicked hard to maintain our position. On one drop I spotted a pair of white-spotted groupers in a crevasse. I didn’t know exactly what species they were but I know tasty when I see it and they were both around 20lbs. I lined up and stoned the larger one. At least I knew that my gun worked! When I brought the fish up Avidel was unimpressed but Jose was stoked. It turns out that after wahoo this species of grouper is his favorite fish to eat. He proved it by turning it into a delicious curry that night. 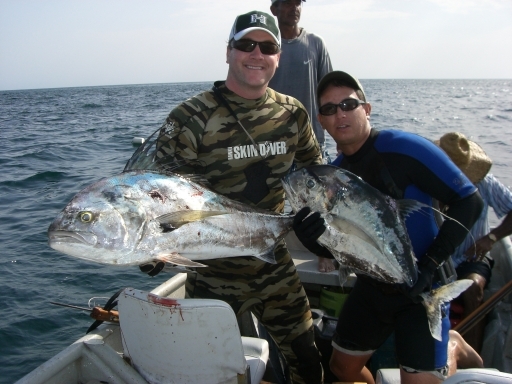 The rest of the afternoon saw Jose bring in a nice rooster fish and me shoot a couple of jacks in the 15-20lb range. Large for Hawaii, but I realized that I was in a different league here in Panama. Bob and Brian didn’t land any fish, but with the current ripping and the visibility low, we called it a day and headed back to the farm for some well-deserved rest. On the way back I asked Jose how he’d managed to land all those nice fish while the rest of us didn’t even see them. He said that the key is to watch the bait fish to see what they’re doing. Once you figure out how they’re moving you can guess where the predators are. When in doubt, he recommended dropping into or just below the bait fish and then facing into them, waiting to see what came up behind them. It was good advice, and I put it to use the next day. The following morning we headed out to the same spot to try our luck again. On the way there we came across the largest fish boil I’ve ever seen. The ocean was boiling with bonitos and other fish over what had to a couple of football fields of surface. We immediately geared up and jumped in just up-current. As we drifted into the pile, the bottom drifted into view and we realized that we’d come across another seamount. On my first dive I saw a dog-toothed snapper that must have been at least 60 or 70lbs. Unfortunately it had sensed danger and was already heading quickly for deeper water. Jose and Brian spotted some onos hanging around but couldn’t get close enough for a shot. After about 30 minutes of scanning the area we gave up and headed back to the rock we’d hit the day before. This time, I let Bob use my Riffe and I grabbed my trusty Beauchat to do some bottom diving. I was hoping to see another grouper or maybe a large snapper. I was in the water for less than a minute before I sensed something large nearby. Looking up I practically ran into a giant manta ray. It’s wingspan must have been 10 feet across. Jose was near me and together we watched it swim slowly away, trailing smaller fish that cruised in its wake. It was incredible. Later, I came across Brian about 20ft down, who was lining up a shot on a large amberjack. I watched him line up the shot, but he let the fish pass in front of him without firing. I could only figure that there was an even bigger one behind it. Meanwhile, I had drifted closer and the AJ was swimming right at me. Presented with a point-blank shot on the biggest fish I’d seen in years, I didn’t even hesitate. Thwack! I sent a shaft right into the head behind the eye. I’d love to report that I stoned the fish and swam it up to the boat, but no such luck. The wounded jack went right for the bottom and took me with it. Did I mention that I wasn’t using a buoy and that my Beauchat has no reel? After being dragged down about 15ft I managed to fight the fish to a standstill. I kicked hard, trying to overpower my adversary, when with a loud pop the line separated from the gun and the fish disappeared into the darkness, taking my spear with it. I couldn’t believe it. A glance at the gun showed me that the line hadn’t parted, the point of connection on the gun itself had broken off. Brian swam over to me at the surface. "I can’t believe that you shot that fish with that gun," he said, gesturing to the broken tube in my hand. To add insult to injury, I had poached his fish. He was merely waiting to get a better shot. I felt like an idiot. To his credit, he was cool about it, but I knew that I had messed up and I apologized. After resting up on the boat I took my Riffe back from Bob, who had been unsuccessful and was getting chilly in his shorty wetsuit. With a bigger gun in hand, I went back to try my luck again. This time I wouldn’t come up empty. Sure enough, dropping down on the same spot as before I was rewarded with two large AJ’s down around 40ft. One thing I’ve learned to do in Hawaii is drop down silently. It may not have mattered. These guys were oblivious to me as they chased bait fish around. Once again it was an execution-style shot. My larger Riffe drove the shaft all the way through the head of the nearer fish. Line spun out of my reel as I kicked for the surface. I could see the panga drifting not far away. I tried to break the line with my gloved hand as I rose. The fish was strong! When I broke the surface I immediately heard Jose yelling for help. Looking over I saw that he was not far away, struggling with a fish of his own. Bob was on the panga and Brian was too far away to hear. I yelled to him that I had a fish too. He yelled back that he’d shot a huge grouper. With line still peeling out of my reel I was in no position to offer assistance. Jose was also using a reel, and Olmedo brought the panga over and grabbed Jose’s gun. Meanwhile I had a problem. My reel jammed and all in the sudden I was jerked under the surface. I held on tight and with a couple of kicks I made it back up to grab some air before being yanked under again. This was bad. I yelled for help but the panga was still battling to bring up Jose’s grouper. I concentrated on staying afloat. I could tell just by looking at the reel that it was hopelessly snarled. My only hope to save my new gun and this big fish was to out-muscle it. Ok, that’s what I’d do. I didn’t try to gain any ground on it, I just wanted to maintain the status quo until I could get a little help. Fortunately, after a couple of strong runs the fish seemed to be resting. There was still tension on the line, but it wasn’t trying to drag me down. I looked up and saw Jose sitting in the boat, not 50 yards away. Olmedo was pulling in line and it seemed to be coming in too fast. Sure enough, before long Jose’s spear came up and there was nothing on it. The grouper had come off. I felt bad for him, but truthfully I was relieved that I’d be getting some help. The trouble was, they didn’t seem to be moving my way. "Jose!" I called, "I need help over here!" He looked over at me and I could tell that he was still thinking about his grouper. "I’m not kidding dude, my reel’s jammed" I tried to sound reasonable, but I’m sure I sounded panicky. After a couple of more efforts I started to throw in curse words. This worked, because he started to laugh as he looked at me. That’s Jose in a nutshell. Finally they headed in my direction. With help on the way I proceeded to haul up my prize. It took several minutes, but finally I was rewarded by seeing the fish below me. Exhausted, I handed the line to Olmedo, who gaffed the fish and hauled it into the panga. Fish, and gun; safe. Jose was happy for me but we didn’t celebrate until we’d tried several dives to find his grouper, which he estimates was around 200lbs. No luck on the grouper, but I did manage to land another, slightly smaller AJ. Hitting another spot on the back side of the island I dropped down to a ledge about 30ft down and spotted a large dog-toothed snapper just as it started to drop off into the depths. I followed it down and took a long shot, hitting it perfectly just behind the gill plate. I’m not sure if I wounded it badly or if I was just used to fighting feisty amberjacks, but this guy seemed to come up without much of a fight. With three of the largest fish I’d ever seen, let alone shot, in the boat it was time for me to call it a day. The rest of the guys had seen some big fish and had shot a couple, including a pair of nice jacks. That night we ate like kings and built a larger brick oven to smoke all of the meat over an open fire. A few beers and a some nice cigars rounded out the night. The next day we decided to drift dive along the shore of the mainland. We were looking for grouper and snappers, but only saw small stuff. The visibility was better though and with the bottom constantly in sight I felt more comfortable. This was the kind of diving I was used to doing in Hawaii. It was a fun and relaxing day. After another night hanging out around the fire with our cigars, we loaded up the pangas for an early start back to Pedasi. After several more hours of taking a beating it was back to civilization. Bob even got to do some surfing at Playa Venado before heading home. It was an incredible experience and I want to thank Jose for his hospitality. This trip opened my eyes to a new kind of diving. The kind of diving that until now I’d only read about in your magazine! Tedd Tennis and Jose Goldner Spearfishing off the Azuero Peninsula in Panama. These are two very nice African Pompano's they shot while diving on an offshore rock on the Azuero Peninsula. This was a three day spear fishing trip that originated from Pedasi. Pedasi and the Azuero Peninsula have some of the best spear fishing opportunities in the World.